Everything's better when it's bite-sized. Like our nuggets made with tender juicy chicken breast in a crisp tempura coating. Start the fun with our delicious dipping sauces, in BBQ or Sweet 'n Sour. Chicken, Water, Flour (Wheat. Maize), Thickener (1404), Salt, Raising Agents (541, 500, 450, 341, 327), Spices (White Pepper, Black Pepper, Celery Seed), Wheat Starch, Vegetable Oil (Canola, Sunflower), Mineral Salt (451). 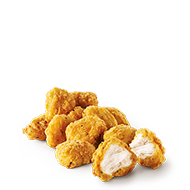 McNuggets are cooked in McDonald’s Vegetable Oil blend and may be cooked in the same vat as products containing milk, egg and soy.